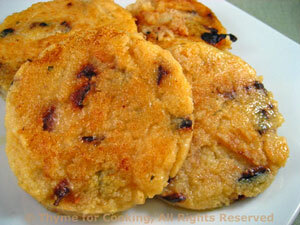 Polenta Cakes, with a bit of olive for interest, Thyme for Cooking side dish. I used metal rings to make these, but they can be free-formed. It's the flavor, not the shape that counts. Bring stock and oil to boil in a small saucepan. Add polenta, whisking constantly - or it will have little volcanic eruptions spewing polenta all over your stove. Turn heat down and cook about 5 minutes (or whatever your package tells you), stirring constantly. When done, stir in cheese, olives and remove from heat. If using rings: Place 2 rings on lightly oiled cling film. Spoon 1/4 of the polenta into each ring and flatten. Let rest 2 minutes, then remove ring and repeat. (I only have 2 rings). If not using rings: Divide the polenta into 4ths. Place each 4th on lightly oiled cling film and pat into circles 3 inches (7.5cm) in diameter. Allow polenta to cool, 10 - 15 minutes (or longer). Heat oil in a medium nonstick skillet. Add polenta and sauté until browned, turn and brown the other side.